The purpose of laser eye surgery is to correct refractive errors and reduce a person’s dependency on glasses or contact lenses. The procedure uses a laser to reshape the cornea, the clear outer layer of the eye, in order to change the eye’s focusing power and improve vision. There are many types of laser eye surgery, but the most common and well-known type is LASIK. LASIK eye surgery is used to treat myopia (nearsightedness), hyperopia (farsightedness), and astigmatism (distorted vision). The procedure takes about 10 minutes per eye in total and is done under local anaesthetic. The procedure is almost painless. Am I a Candidate Laser Eye Surgery or Lasik Eye Surgery? Before this question can be answered, one has to have a thorough evaluation. This will include a general eye examination, corneal topography (mapping), pressure check and measurement of the corneal thickness. It will also exclude any general eye disease. Only then can the surgeon tell you if you are a candidate. The minimum age of 18 years provided the refraction is stable. There is no maximum age. 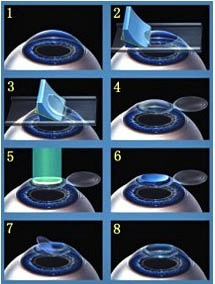 The refractive error must be in the range of treatment that the laser is capable of treating. If you need more information regarding Laser eye surgery cost in South Africa or if you are suitable, book a consultation with our professional and helpful assistants. During the procedure, the corneal tissue is carefully flapped open with a special oscillating blade. The cornea is then lasered, and the protecting tissue gets flapped back into place. Corneal tissue has excellent natural bonding qualities that allow effective healing without the use of stitches. Eyes usually heal extremely fast, and the results are good, with most people achieving normal or near normal natural vision within the first week. The eyes are covered with a transparent plastic shield for the first night. This is only a precautionary measure. Antibiotic drops are used for a week afterwards. The vision will be slightly blurred for the first few days after the operation, but usually patients are able to perform their daily activities the day after the operation. Light sensitivity and glare at night normally disappear within six months. If there is regression, enhancements can be done within three to six months after the operation. Care must be taken not to rub the eyes. No contact sport for three months. Normal exercises such as running, aerobics, gym training may be started within two days. No mascara or eye liner for one week. Over-correction & under-corrections. Though these occur in less than 15% it depends on the initial refraction. The higher the refractive error is the greater the chance of having under-correction. Enhancements may be done three months or later if the cornea is thick enough. There is a small risk of infection, but antibiotic drops are instilled after the procedure and for a week after the operation. The incidence of haze for Lasik is very low. Post-Operative pain. This is usually not a problem, some patients may experience varying degrees of discomfort. If the eyes are painful one should take normal pain killers & lie down with the eyes shut. Normally by 24-48 hours all discomfort has been cleared up. Corneal flap complications. The incidence of this is small. They include flaps that are too small or short, inadequate thickness, inadequate quality & smoothness, or a loose flap. If one of the above occurs surgery is normally abandoned after replacing the flap. A few months later the procedure can safely be repeated. Epithelial ingrowth. This occurs when surface cells grow in underneath the flap. Minor degrees of this are not treated and do not cause problems, but if there are large areas the flap is lifted and the cells are scraped. It is done under topical anaesthetic & sedative. There is normally a feeling of pressure but pain is rare. What is the long-term effect after Lasik? There have been extensive clinical trials and so far no adverse long-term effects were found. What are the risks of the Lasik procedure? Can I go blind? The risks are minimal and blindness following lasik eye surgery is extremely rare. If my eyes regress after having Lasik eye surgery, can I wear spectacles or contact lenses again? May I watch TV, work on the computer and read after the Lasik surgery, or will it hurt my eyes? You may continue doing all of the above. It will not harm your eyes. When may I start driving my car after the Lasik procedure? Most patients are able to start driving their car one day after the surgery if you feel comfortable doing so. Will Lasik surgery prevent me from having to wear reading glasses later on in life? No, you will still need to use reading glasses. This occurs after the age of approximately 45-50 years of age. It is due to normal physiological changes of the eye as the lens starts to age.